Howard Gilbert has been at the Welwyn and Hatfield Practice for about a year now and adds his own sparkle, humour and unique sports experience to our team. Howard studied osteopathy at the British School of Osteopathy (BSO), the oldest and largest osteopathic school in Europe and qualified with a Bachelor of Osteopathy (BOst) degree. He has experience in treating a wide range of conditions, including pregnant women, the elderly and sports injuries, amongst others. Howard combines skilled sports massage techniques with osteopathic treatment to provide a unique service. At university Howard studied Japanese and business, and upon graduation was employed in Japan for 2 years as a Co-Ordinator for International Relations. Once back in the UK, he trained, qualified and worked as a City broker for 4 years. Realising that an office job was not for him, he decided to learn about the body. Having participated in numerous global triathlon events and suffered from niggling sports injuries, this fueled a desire to study manual medicine and treat the body as a whole in order to resolve symptoms. Howard qualified in Personal Training and Sports Massage Therapy in March 2004, and was then employed as a sports massage therapist in La Manga Club resort in Spain, treating golfers and tennis players. He then spent 14 months working in a ski resort in Norway, in Scandinavia’s only Shiseido spa at the prestigious Dr Holms Hotel in Geilo, doing sports massage and other treatments. 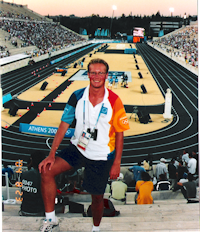 In 2004, Howard was an interpreter for the Japanese national swimming, gymnastic and cycling teams at the Athens Olympics. He has a current First Aid certificate valid until 2012, has been trained in the use of ultrasound and is qualified to undertake dry needling (a form of acupuncture). He is currently the Civil Service Rugby Club osteopath, giving both pitchside first aid and treating various injuries. Howard, a keen triathlete, has completed 3 Ironman competitions and represented Great Britain in the 2002 Long Distance Triathlon World Championships. He is an avid downhill and cross country skier, a kendo participant (Japanese fencing) and is a cycling enthusiast. He loves traveling, having visited over 30 countries, shadowing osteopaths in Spain, Norway, Japan and Australia. Every patient is individually assessed ,treated ,advised and educated ..
We have been told on many occasions that the reason why people return to the Welwyn & Hatfield Practice is because we give good quality , individual attention and we genuinely care about our patient out comes.